Oh hi, Pat! Haven't heard from you in a while, how are you? Yep, Kevin got back fine, no problem. He took the Auto Train and slept in a tiny room that was 4 by 8 feet. My closet is longer and a little bit wider in the big bedroom. It was a lot better trip than we had when you and I were kids trying to sleep in one of those silly airplane style semi-reclining seats. Right, well he went up to visit his mom for her birthday and spend some time with her. Longwood Gardens, a couple nice restaurants, and made it all the way to Cape May just like the song. 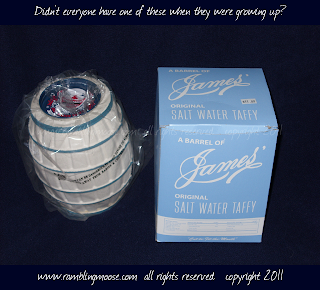 He sure did bring back that Salt Water Taffy! In fact he brought back a barrel bank just like we had every year when Dad would take us down to Atlantic City for the day before the Casinos moved in and wrecked the boardwalk. That's why when I went for a day trip, I'd go to Ocean City, NJ. Yes, the Methodists have kept it fairly old school and you can still get a good funnel cake or fresh peanuts - or at least you could back in 2005 when I was there last. That bank? I'm going to keep mine! It turns out that James Candy and Fralingers are the same company although I think we knew that. They're discontinuing the banks so if you want a little piece of our childhood, you had better get Down-a-Shore and pretend to be a Shoobie for a day. Pick one up and enjoy, they're not expensive, after all they're made out of Papier Mache. Sure, you know the salt water taffy at the Jersey Shore blows away any other kind! The stuff just over on the other side of the Delaware River in Rehoboth or in Ocean City MD just doesn't taste right and they don't make it soft like James Candy does. I had some in Cape Cod Mass that was just horrible, like old tub caulk! No I'm not in the habit of chewing that stuff, silly! But the neatest thing is that they're still making those weird old flavors like they used to! Anise, Molasses, Teaberry... yeah! I mean where else but the Jersey Shore! Just like old times walking down the Boardwalk and biting into one of those wonderful Lemon Salt Water Taffys and you had to be careful because you would have sand on your fingers. Yes, Atlantic City is the real Boardwalk, the rest are just imitations but even that has changed since they blew up all those wonderful old resort hotels. The city itself is a bit scary but the tourist trap, er tourist areas are safe. Sure, I had what they call Salt Water Taffy here in Florida. Hard as a rock and salty as a pretzel. Scary stuff right? At least they still make it like they used to at the Jersey Shore. "Cut to fit the mouth" like they say! Oh that bank? Did I tell you some clown running an auction house wanted $50 for a barrel bank and the box with it? Yeah isn't that a riot? You can still get them for now for $12 so move fast. Oh and have some vanilla custard for me while you're at it - you know, from the stand at 9th street in Ocean City! Watch for the Sea Gulls if you're going to have fries, those birds are fierce!